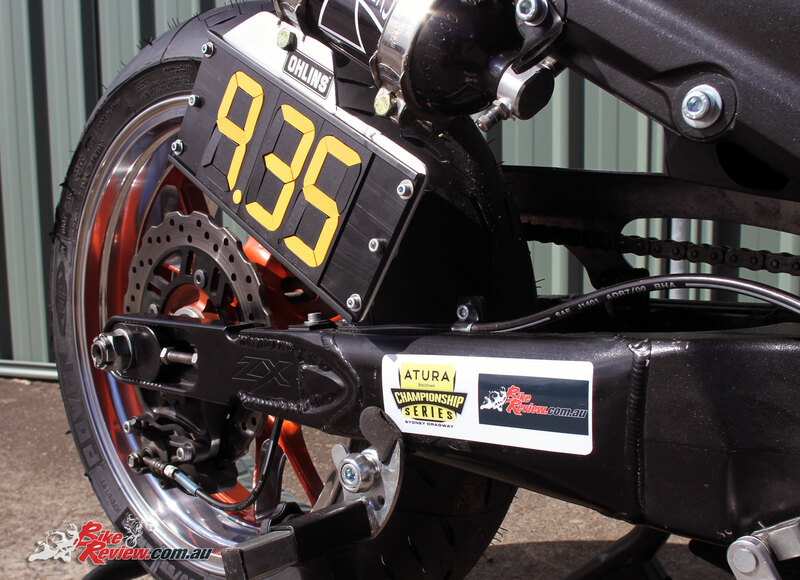 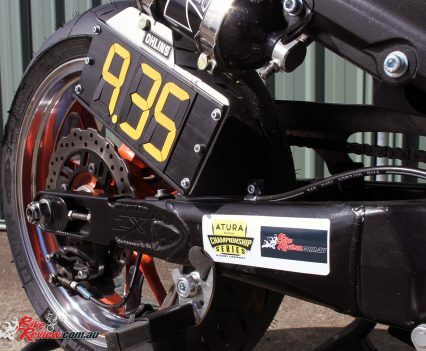 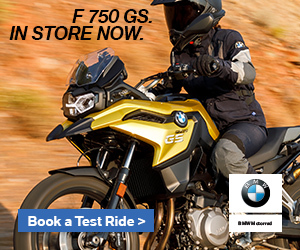 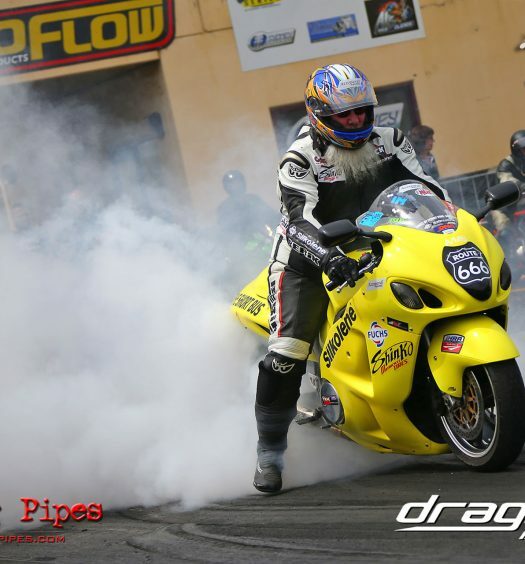 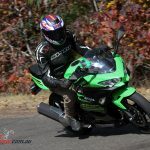 It’s hard to argue that motorcycling doesn’t have its fair share of risks, especially riding on the road and when you run your own business, have a family relying on you, and need to weigh up every decision, so sometimes getting your riding fix in another fashion can be a more ideal solution – like at the drag stip. 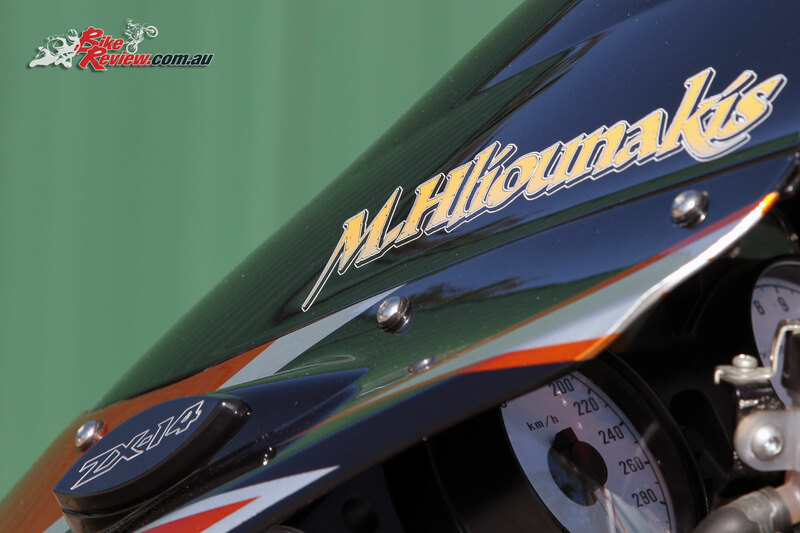 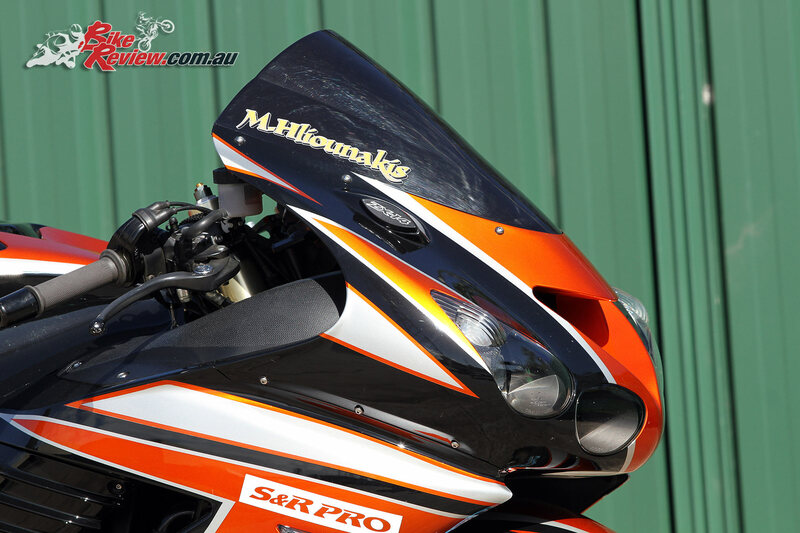 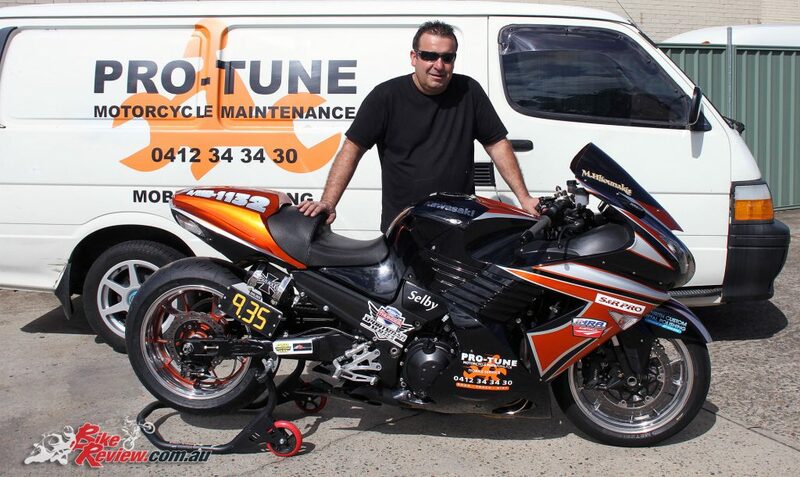 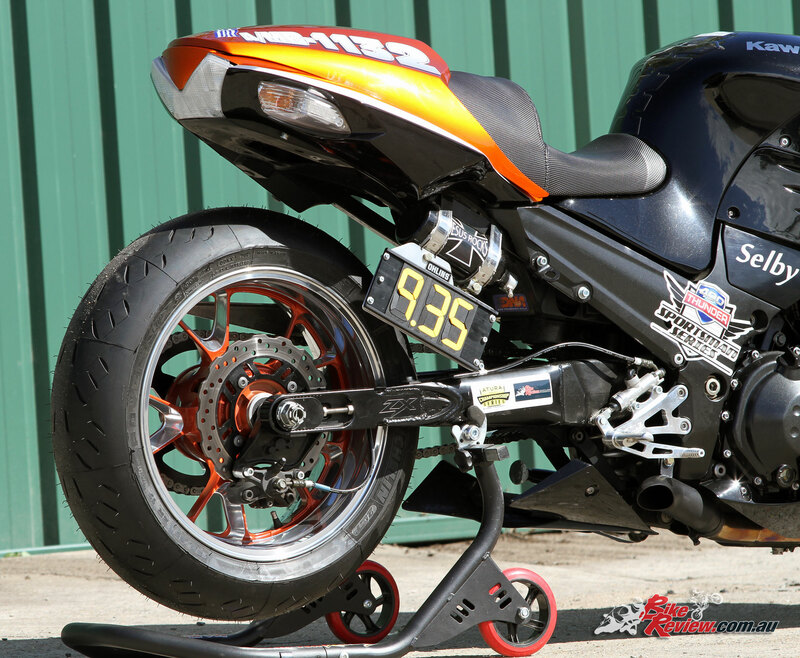 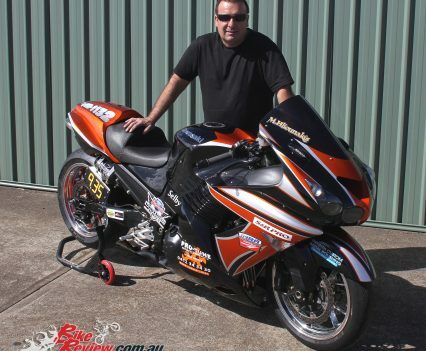 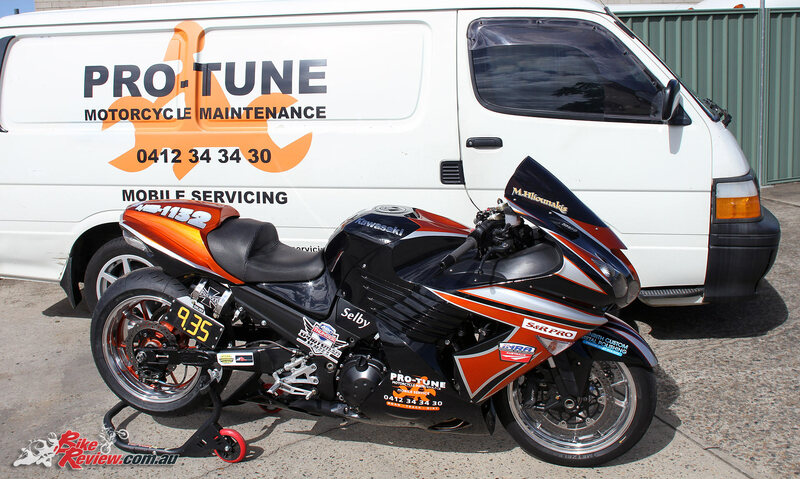 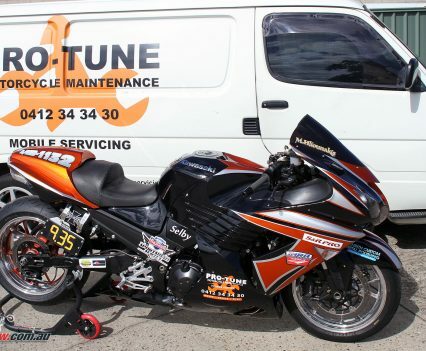 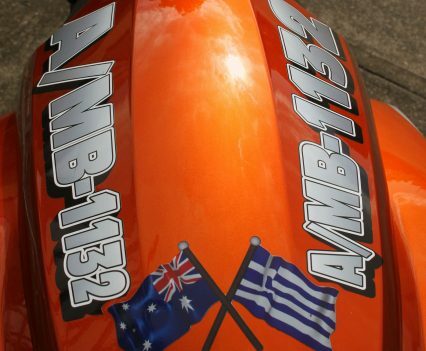 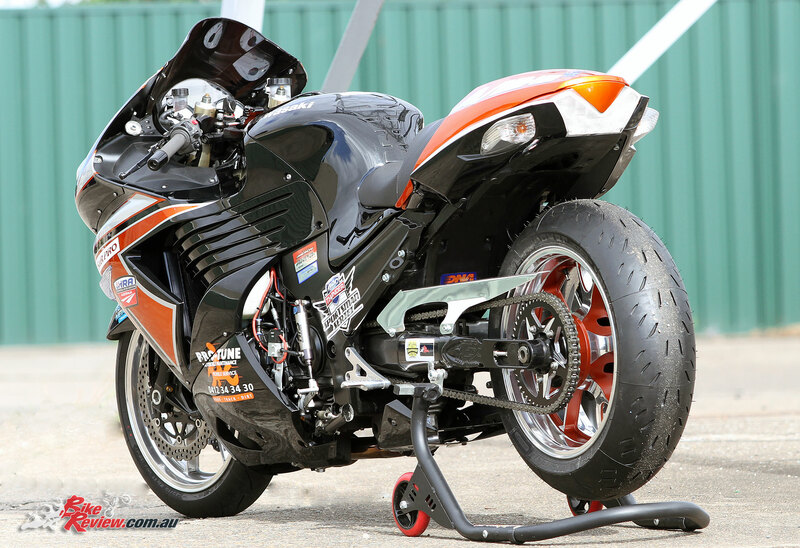 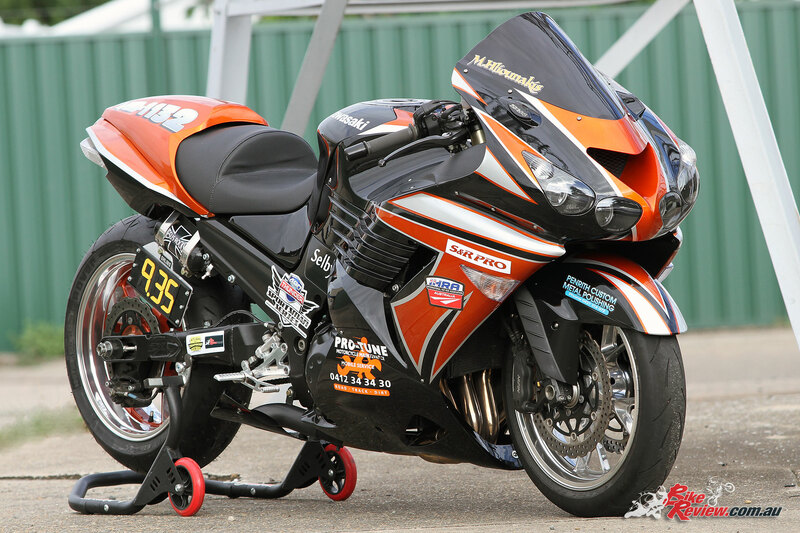 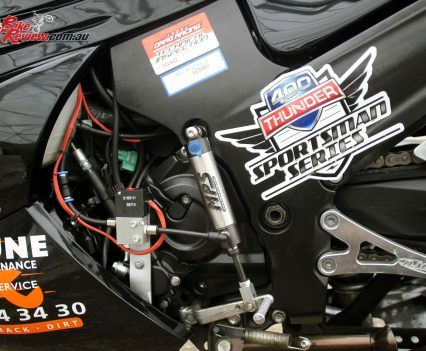 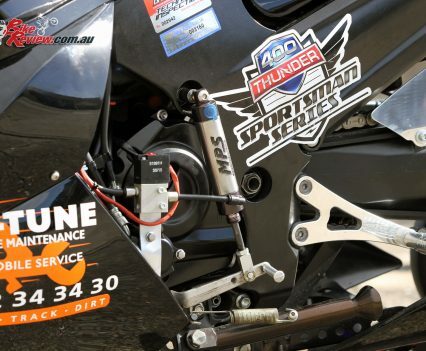 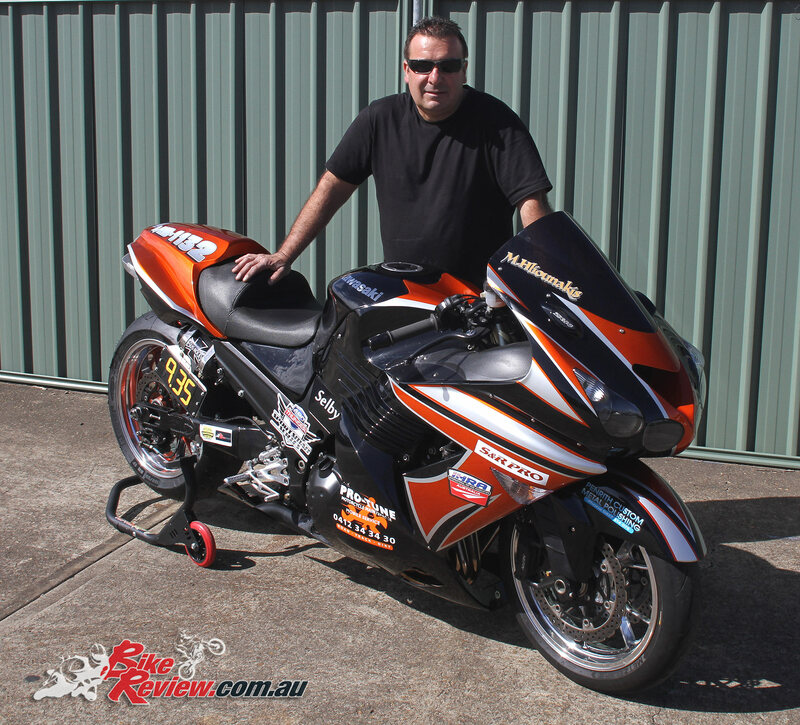 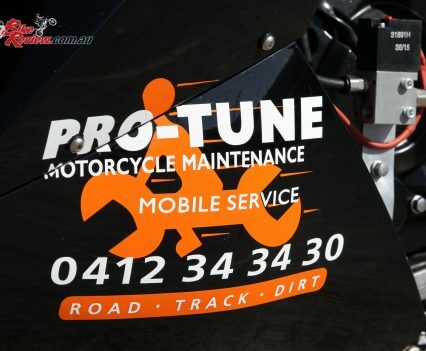 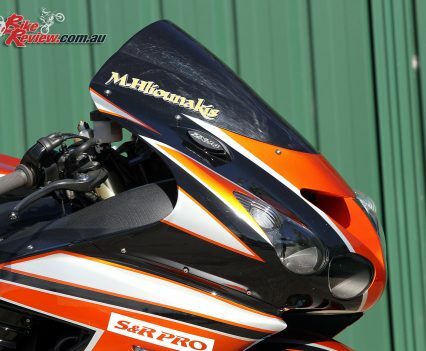 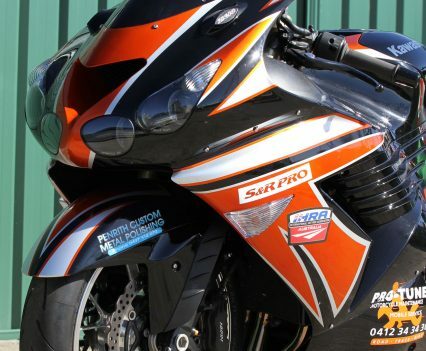 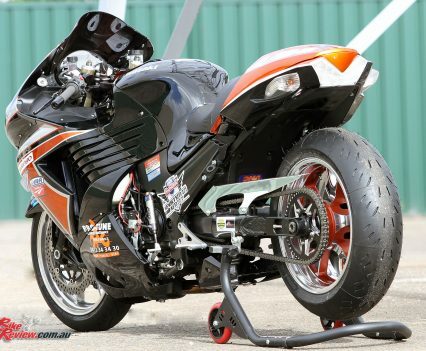 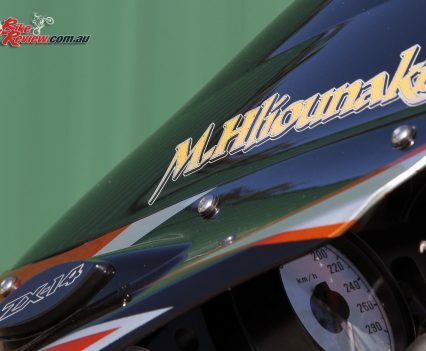 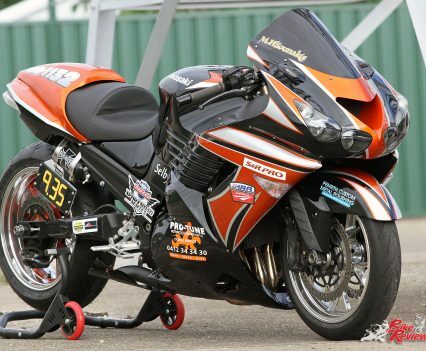 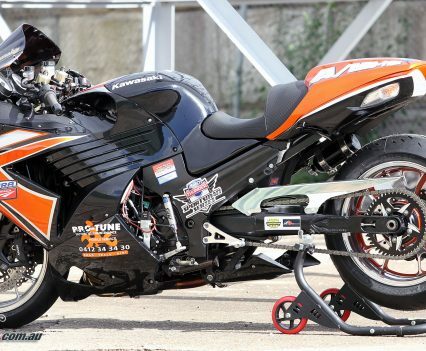 Enter Manuel, owner of this nine-second ZX-14 dragbike and of Pro-Tune Motorcycle Maintenance, which specialises in mobile servicing. 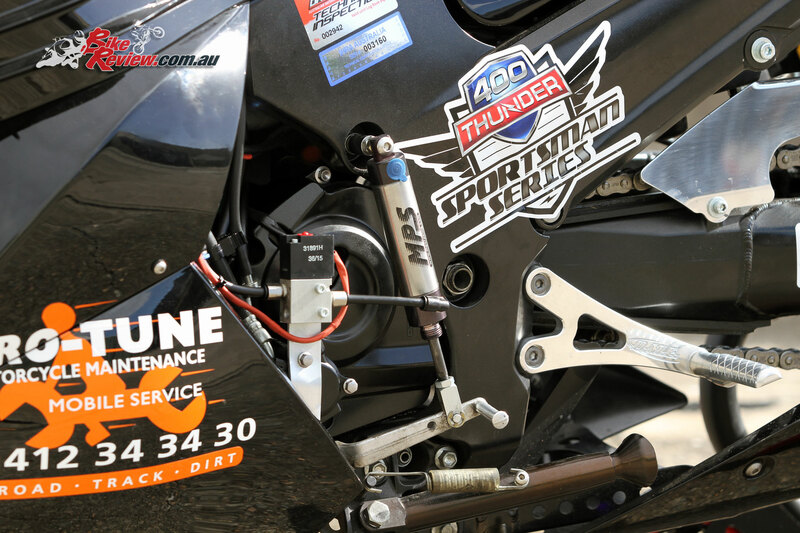 With a job that requires plenty of time on the road, heading to the drags is an ideal outlet, allowing for that speed fix and helping minimise the chance of injury. 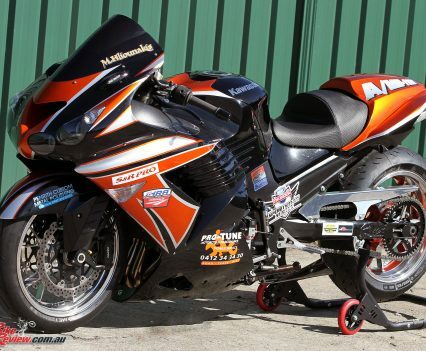 Considering I’d been wondering why he hadn’t chosen a Hayabusa, that was a fair point! 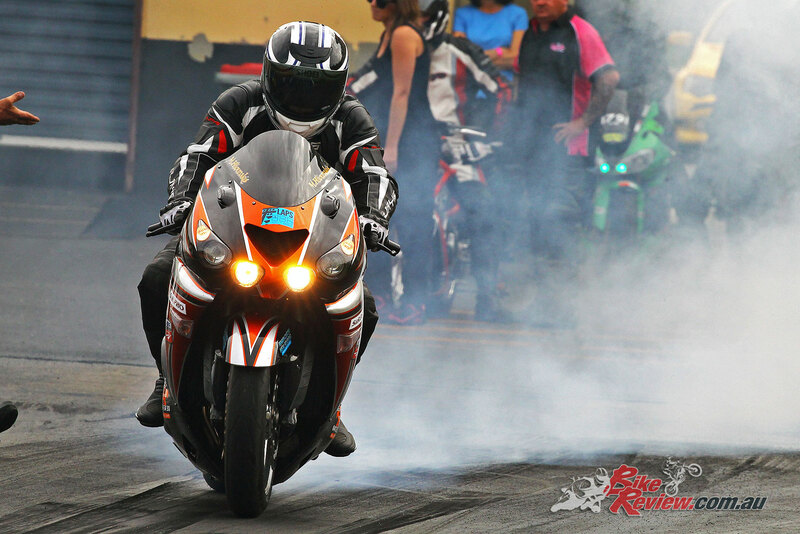 This was back in 2015, and since then the bike has been transformed into a true dragstrip terror, dubbed by Manuel’s children as ‘Toothless’, after the movie How to Train Your Dragon. 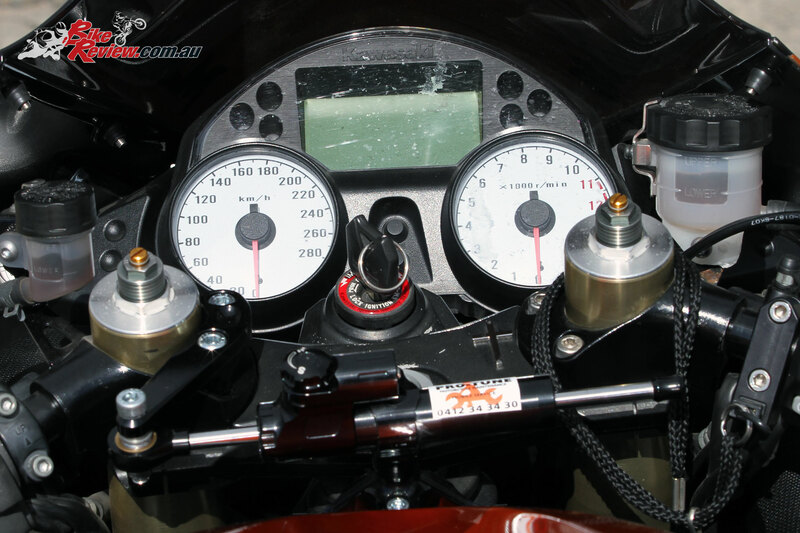 Looking at that front end you can see the resemblance, and those down strip speeds certainly mirrors the characters turn of speed. 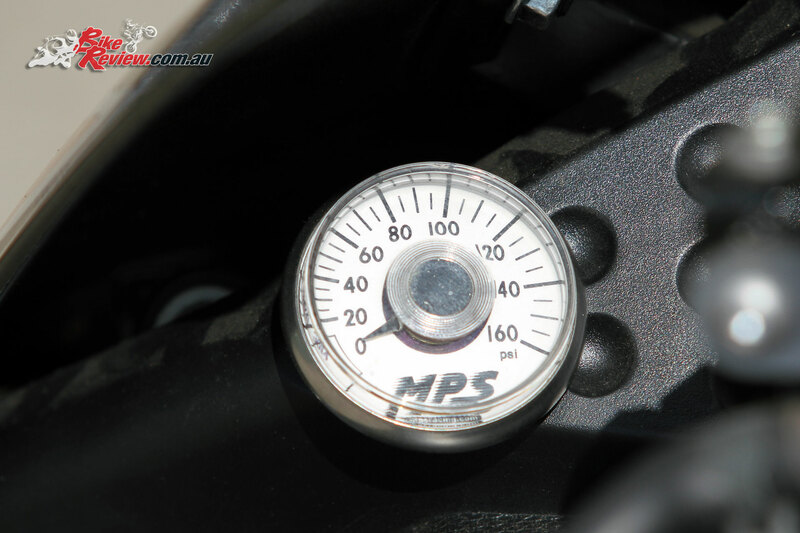 With 188hp on tap at the rear wheel, Manuel’s ZX-14 is well ahead of the ‘claimed’ 170hp, which is normally a particularly generous estimate. 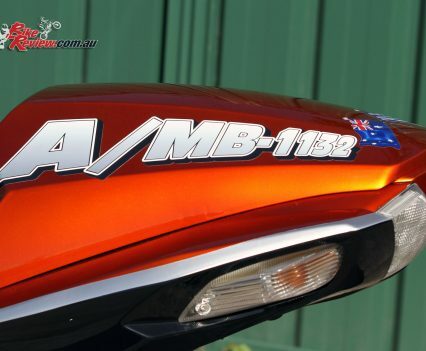 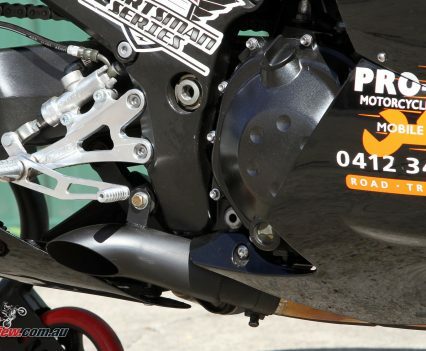 Performance modifications are also relatively limited considering the power output, with the addition of a Power Commander, DNA airfilter, Two Brothers headers and a custom S&R Pro muffler. 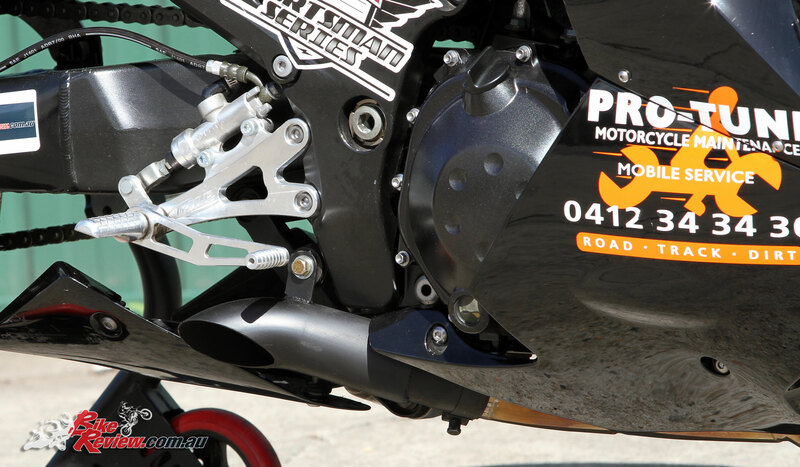 The muffler itself is a lightweight single exit affair, situated under the belly, ensuring no unneeded weight and good weight centralisation. 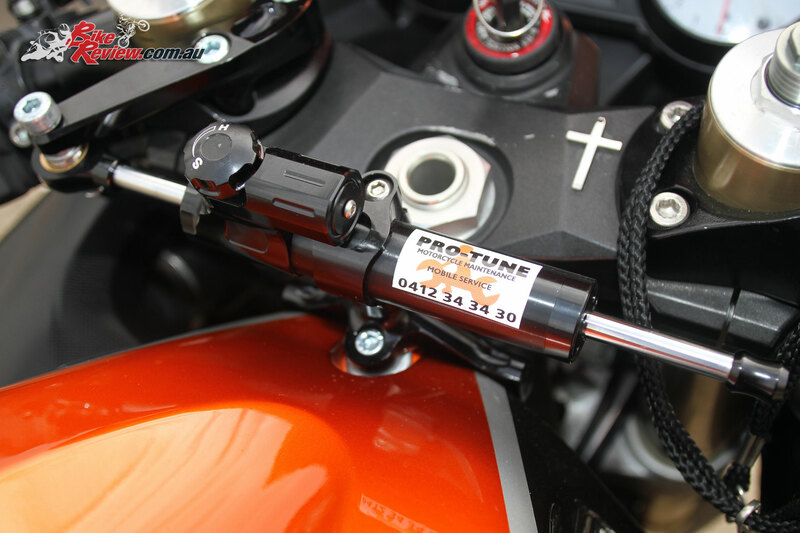 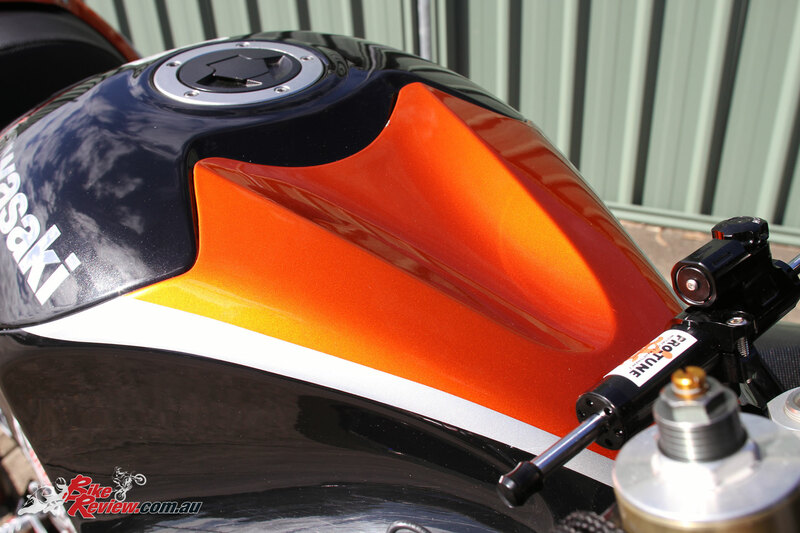 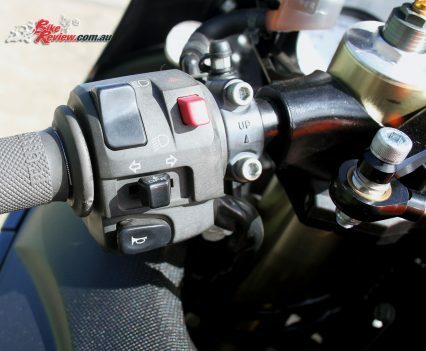 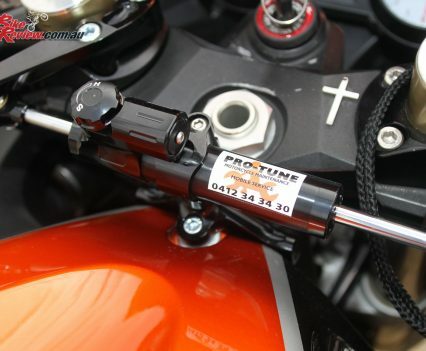 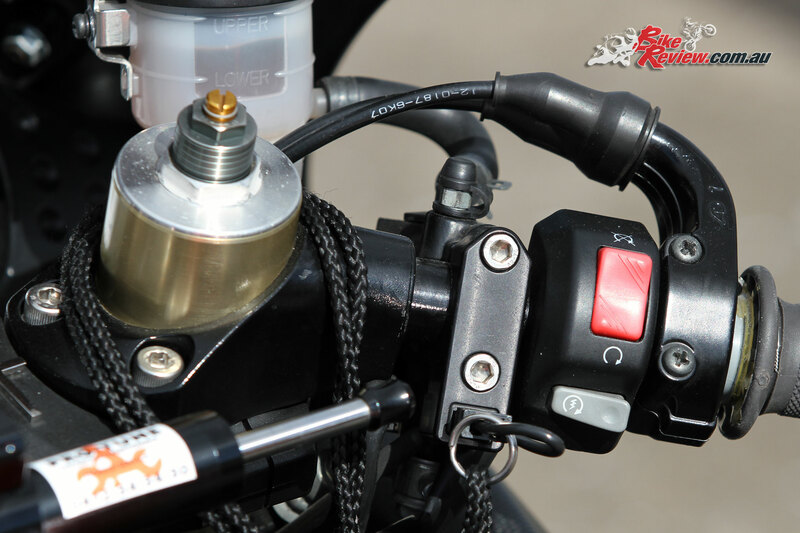 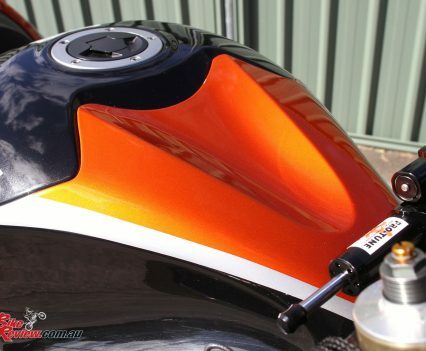 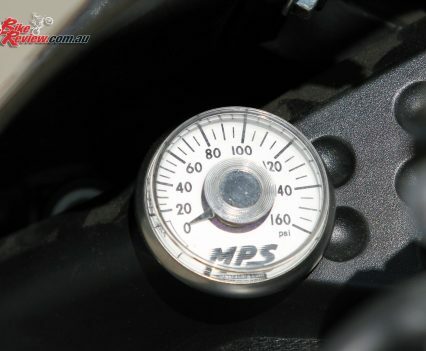 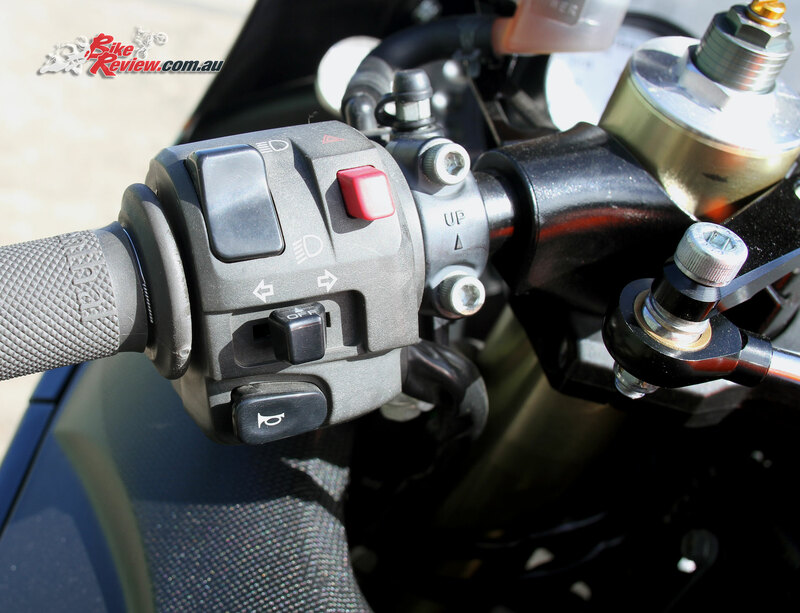 Assisting with getting down the dragstrip post haste is a MPS Air Shifter system, which is connected to the horn button and uses compressed air, with a pressure gauge included in the cockpit to keep an eye on pressure levels. 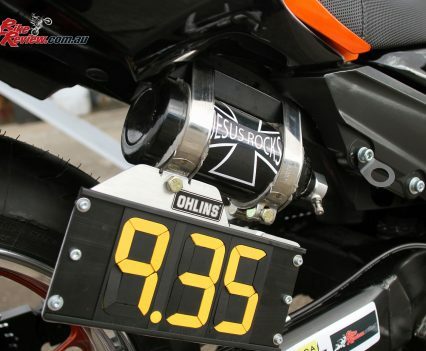 No boost… for now! 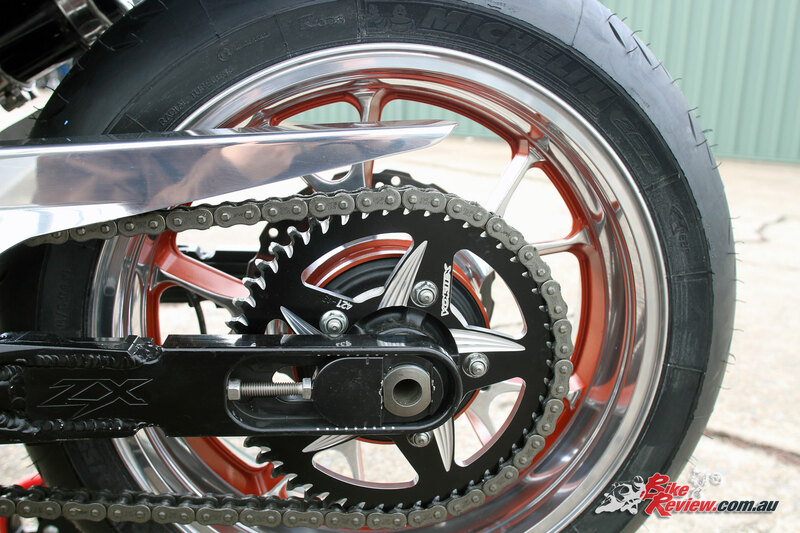 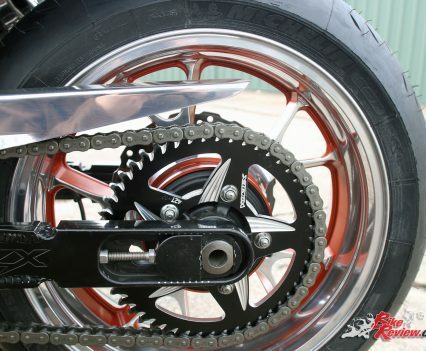 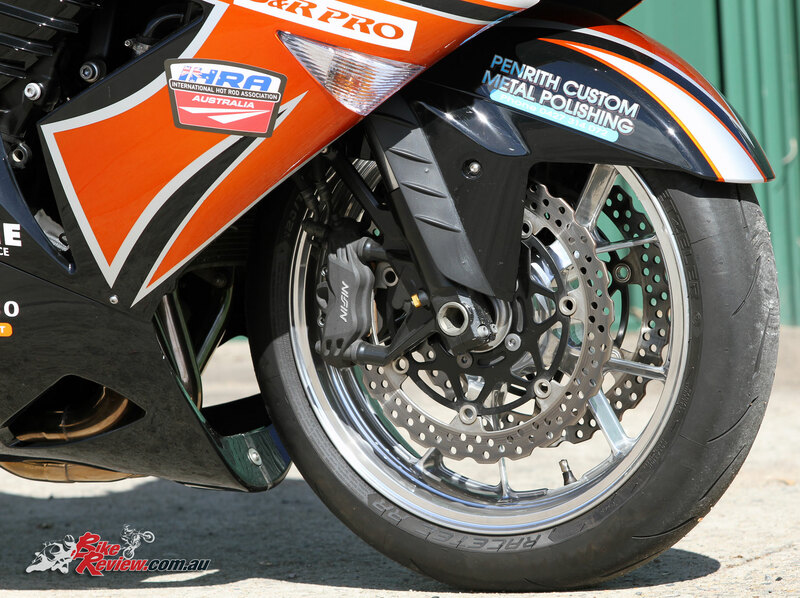 The standard clutch has been retained, while an EK Drag Chain runs off the standard front sprocket, with a 46 tooth Vortex rear sprocket adorning the rear end. 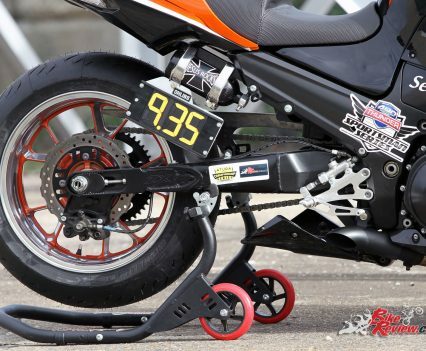 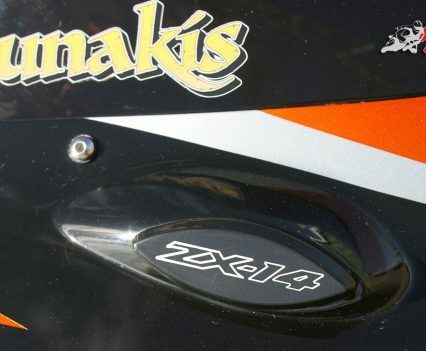 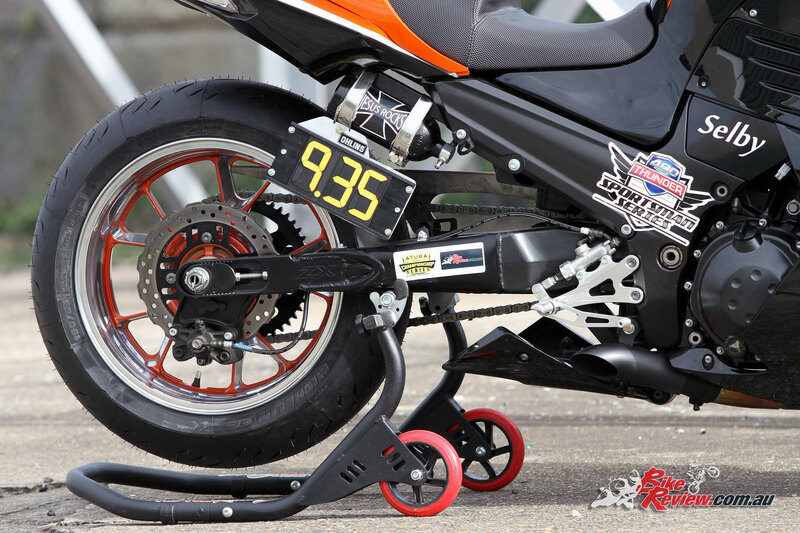 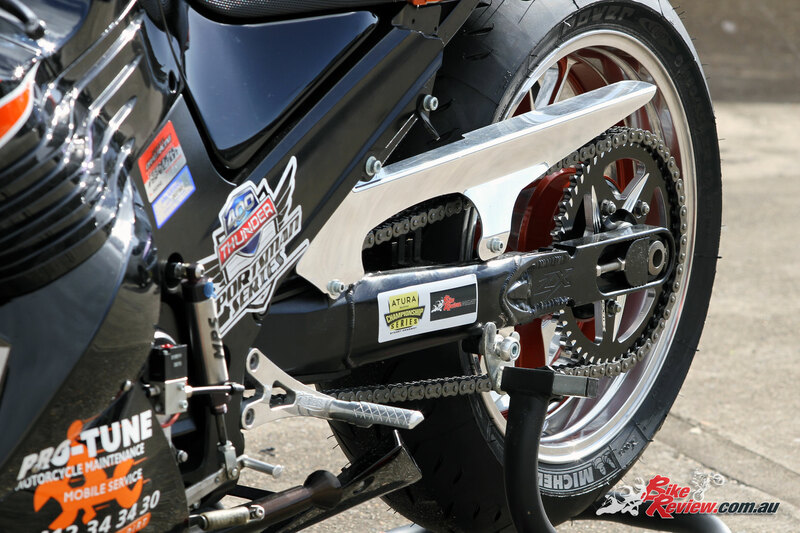 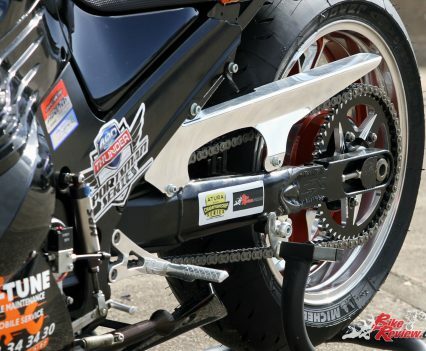 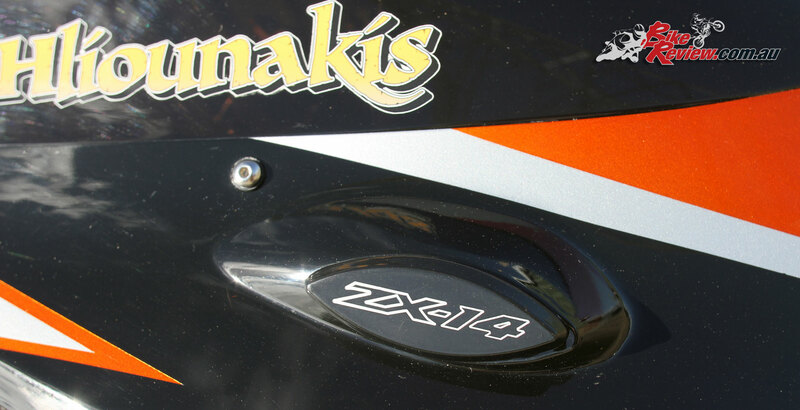 An extended eight-inch longer swingarm was also fabricated up by Manuel from the original item, helping to keep power to the ground and enhance stability, and is proudly embossed with the ZX logo. 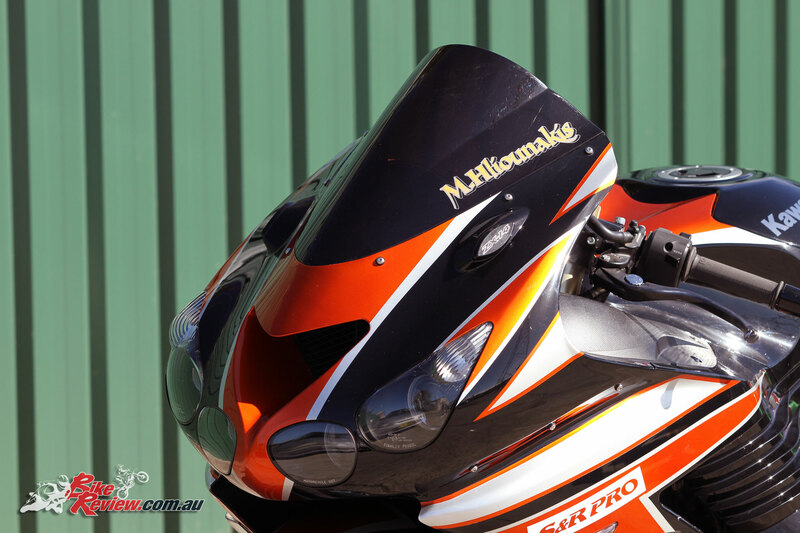 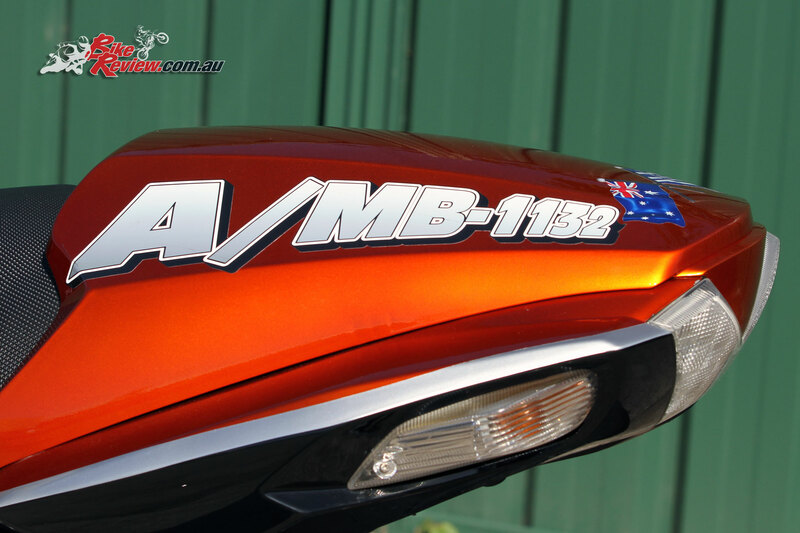 The bodywork’s paint scheme was also designed by Manuel and sourced from overseas, with the metallic orange holding great depth and really standing out when we got the rare ray of sunshine on the day of the photoshoot. 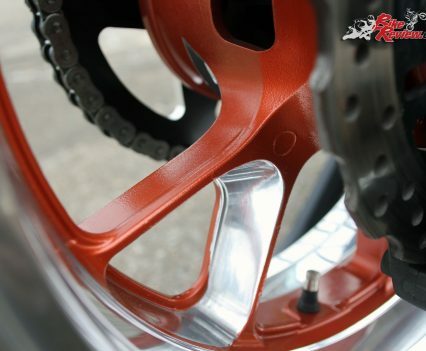 Manuel was a little surprised when the bodywork turned up with the Hong Kong Orange proving a bit closer to bronze than he’d originally envisaged, but it certainly looks the business. 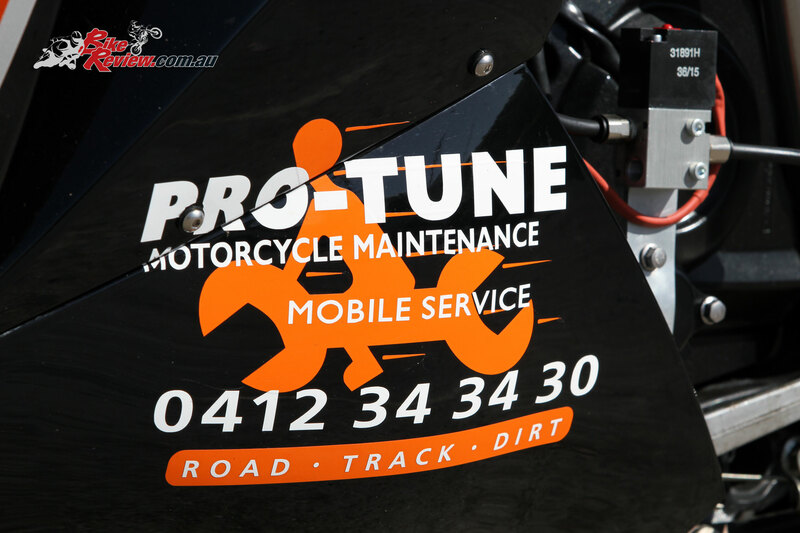 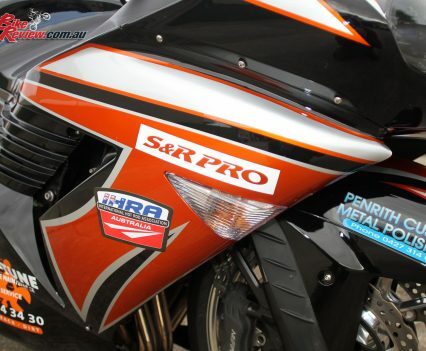 Excite Signs in Penrith created all the decals, while that magic 188hp is thanks to Jamie from S&R Pro, who designed the custom muffler as mentioned and helped Manual maximise performance gains, “A big thanks goes a Jamie from S&R Pro – his knowledge and experience on setting up a well behaved drag bike is greatly appreciated,” he explained. 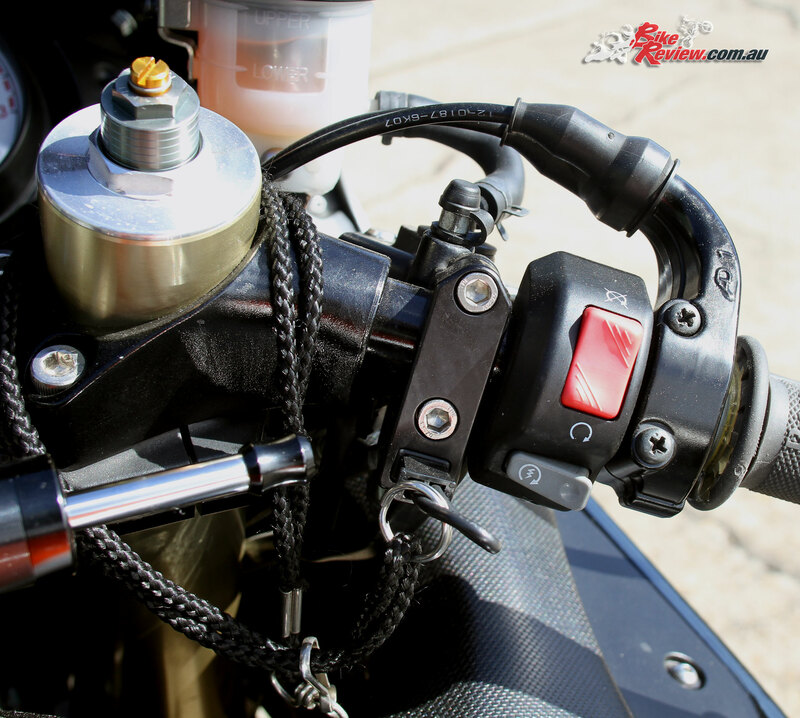 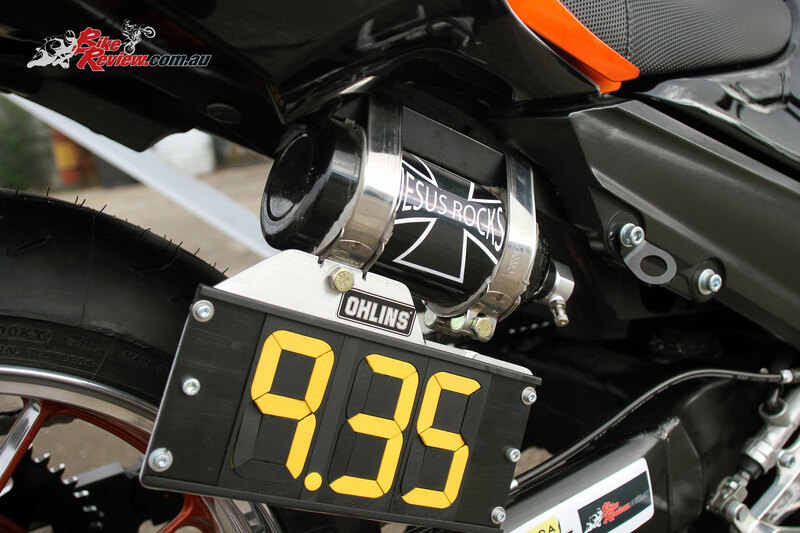 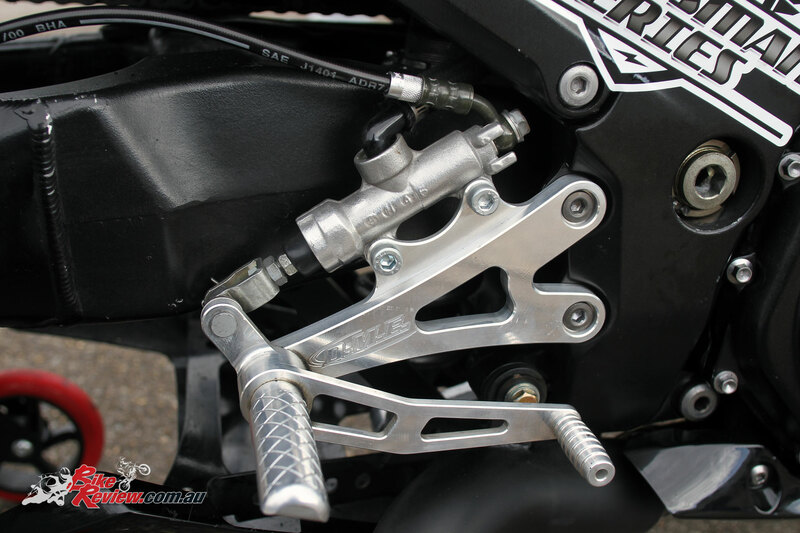 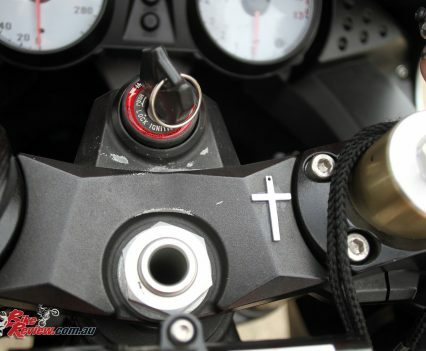 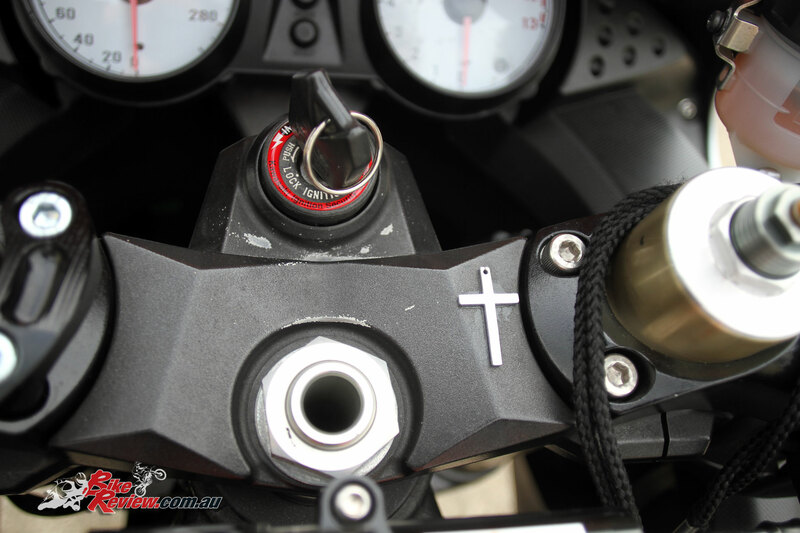 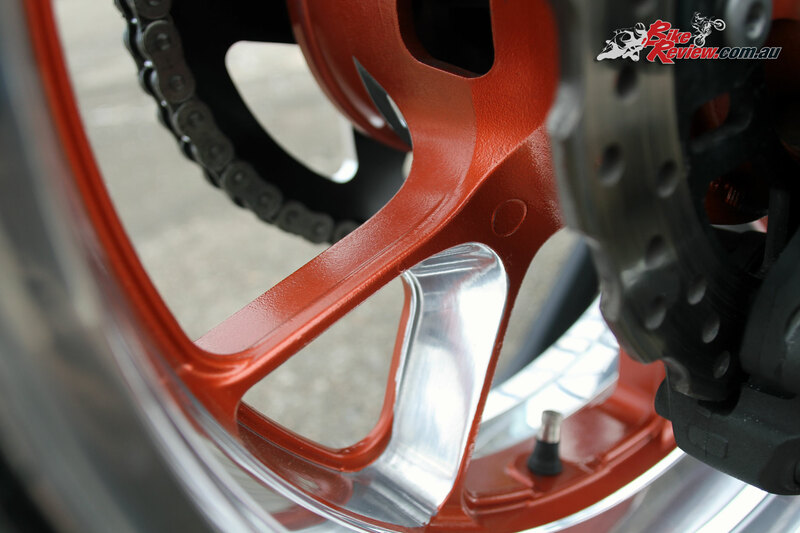 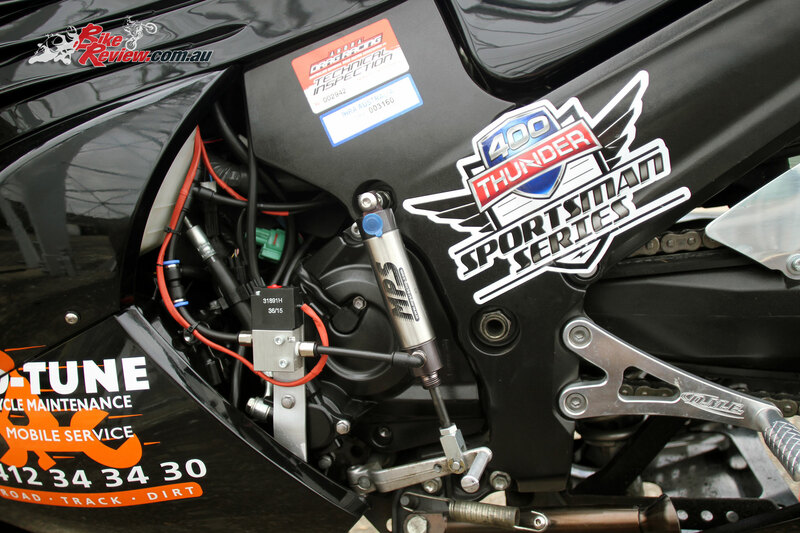 There’s plenty of additional details as well, like the Schnitz Racing kill switch – a necessity for racing, as well as a set of Schnitz Racing rearsets, while Manuel had the seat redesigned to ensure he had enough support on acceleration. 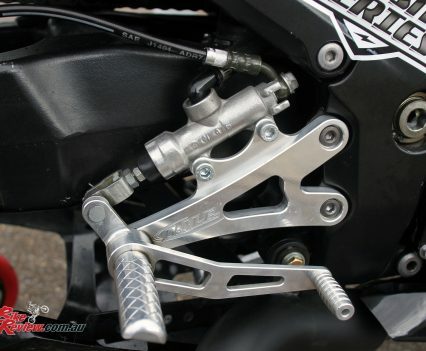 Plus an adjustable steering damper to keep everything pointed in the right direction, with the ability to tweak between runs! 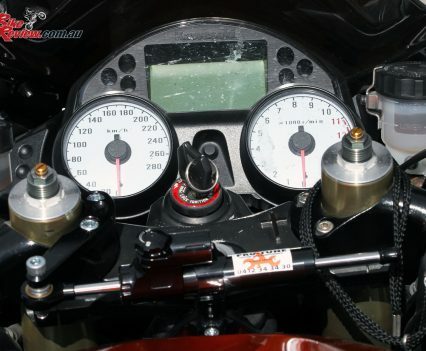 With almost 190hp pushing him to insane speeds Manuel also explained he’d be pushed back along the seat and have to really hold onto the ‘bars to try and remain in position. 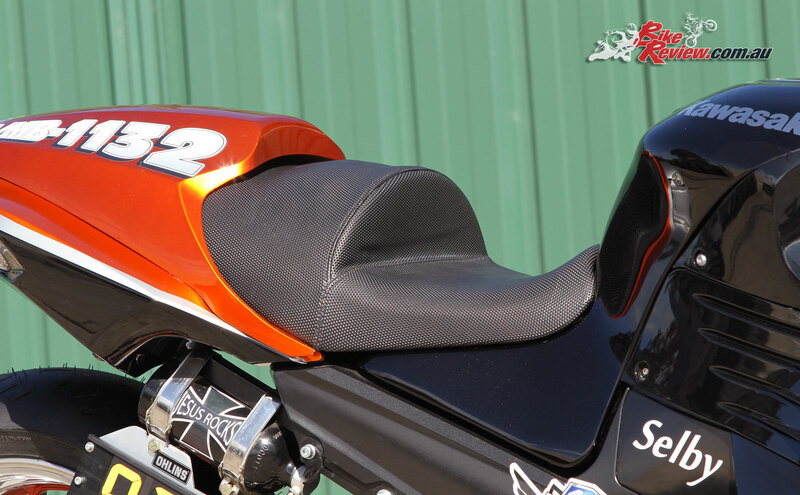 Adding a hump to the seat to match the bodywork looks the business and holds him in place, ensuring all his attention can go to setting fast times. Manuel also replaced the brake lines with braided items, retaining the standard pads, while suspension has been set up specifically for the drag strip. 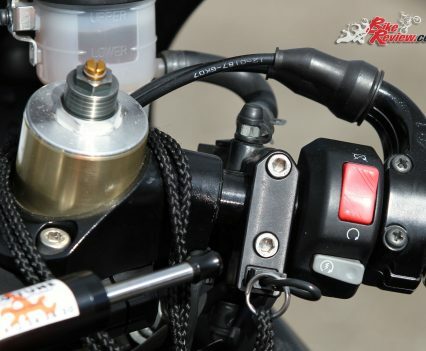 The front forks are significantly raised through the triples, helping lower the bike and offering the easiest solution for a machine which doesn’t need to do road duties. The standard rear shock remains, and has been set for slow rebound and a maximum progressive squat, again helping keep power to the ground, without unsettling the bike, keeping the entire bike low and lean. 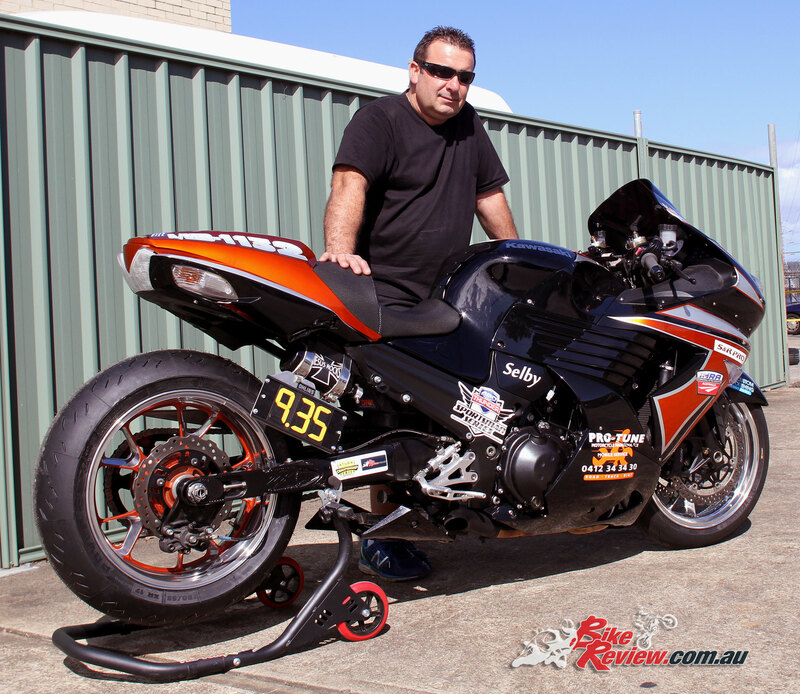 It’s not just money that’s gone into this project for Manuel, although he hasn’t been keeping count, with over 60 hours also spent working on the bike and dialing everything in to get the best and most consistent runs. 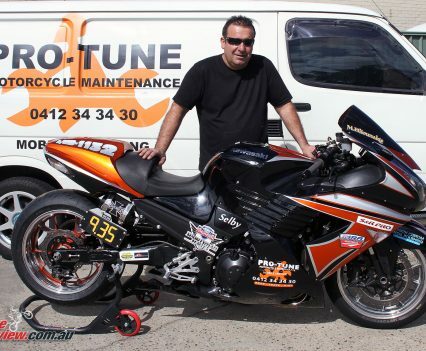 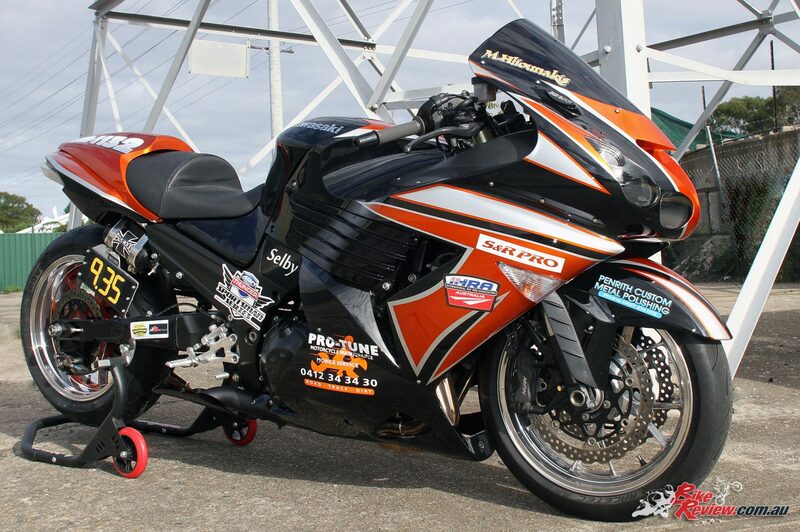 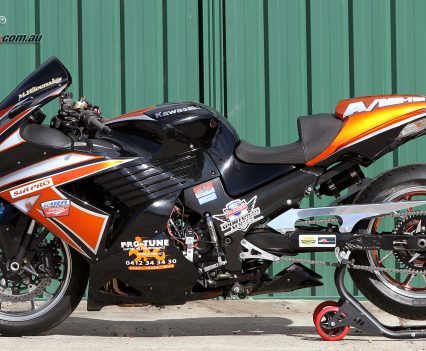 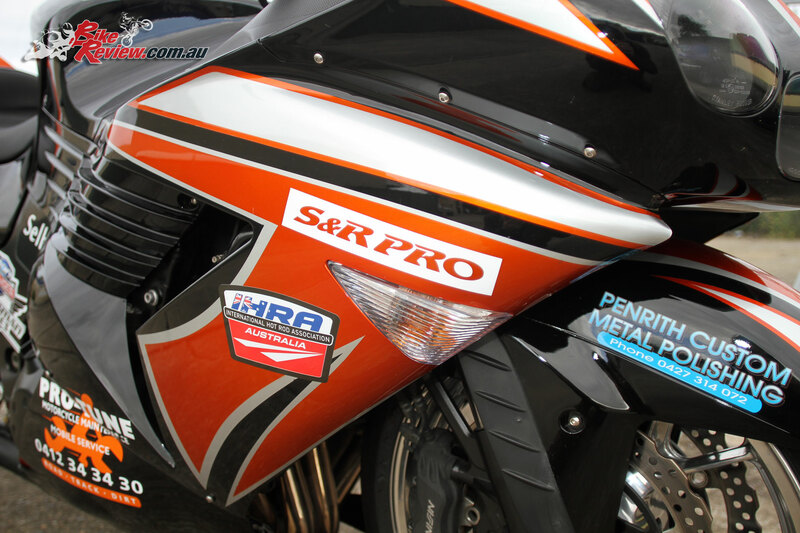 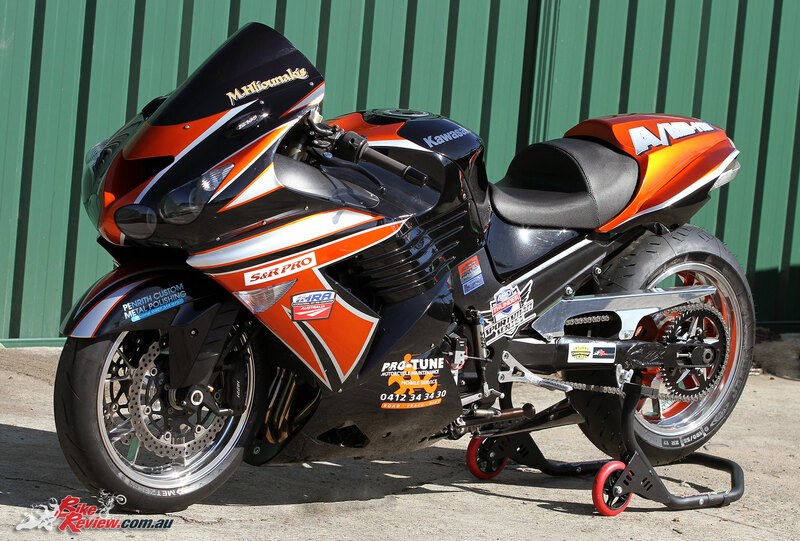 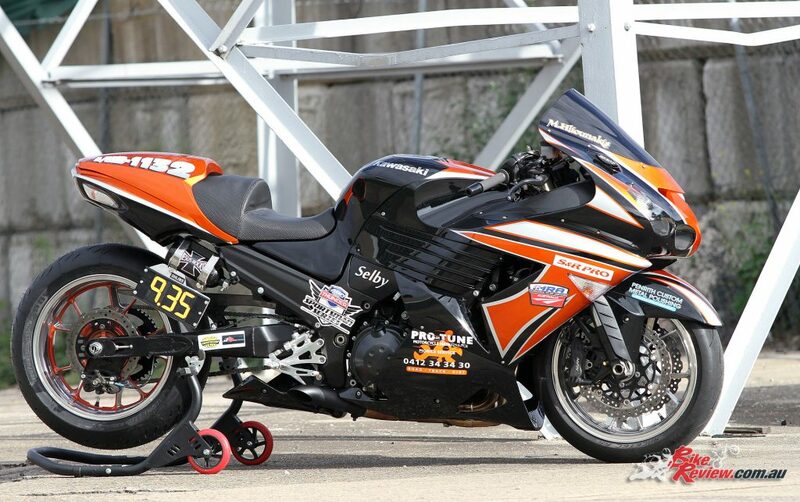 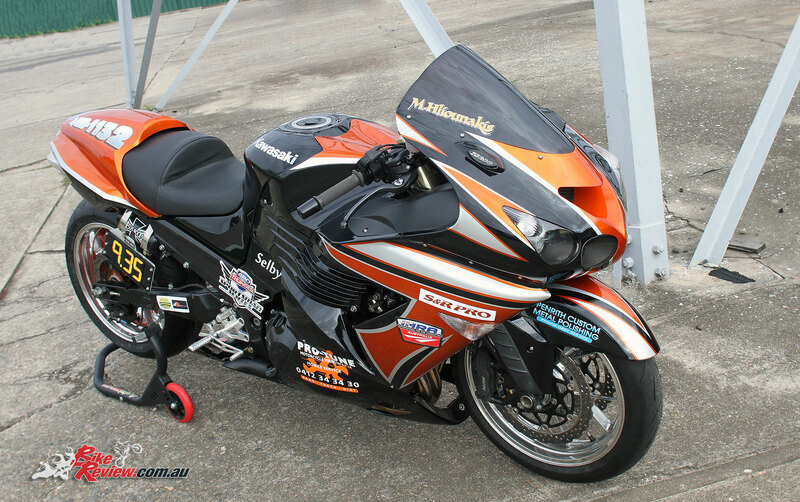 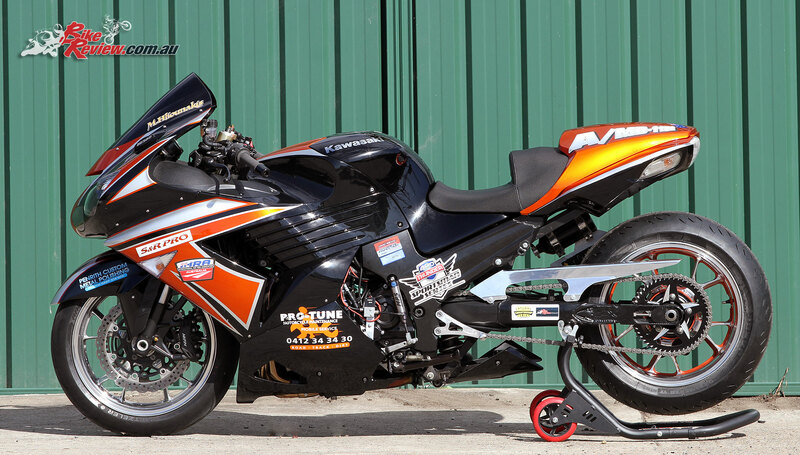 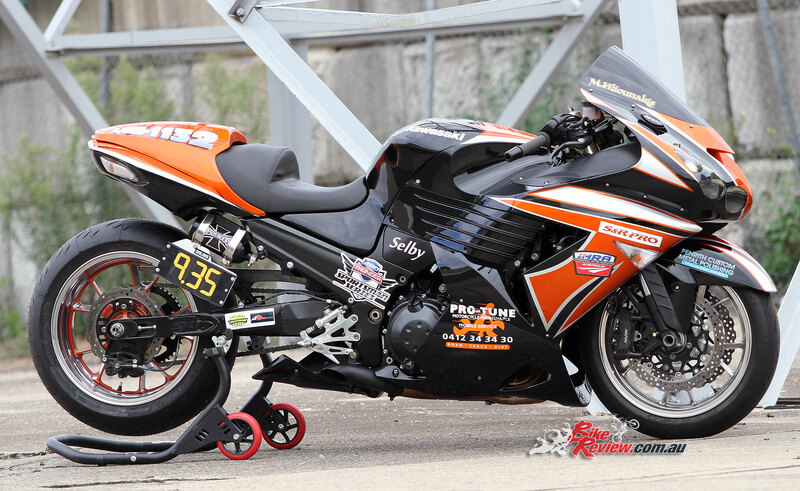 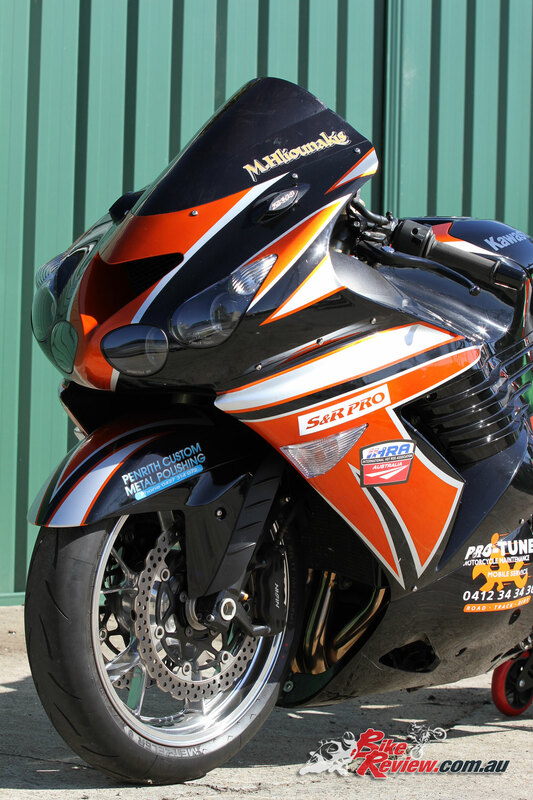 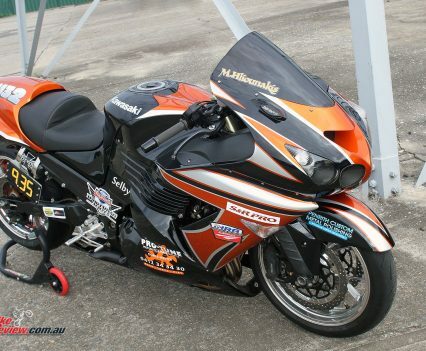 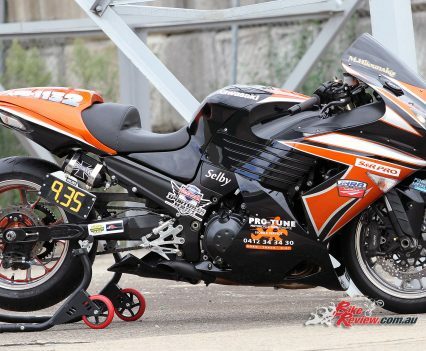 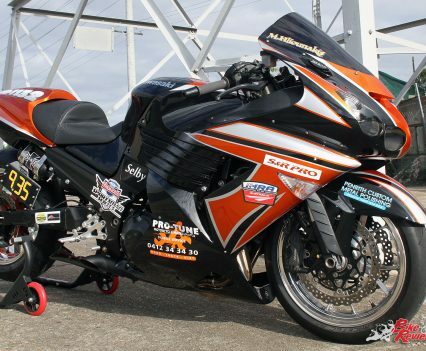 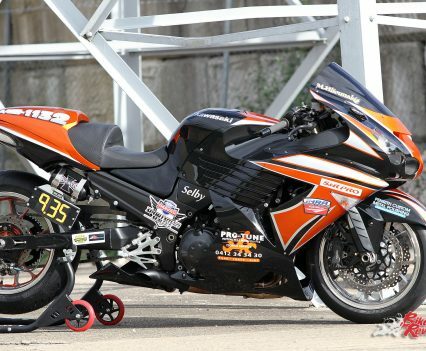 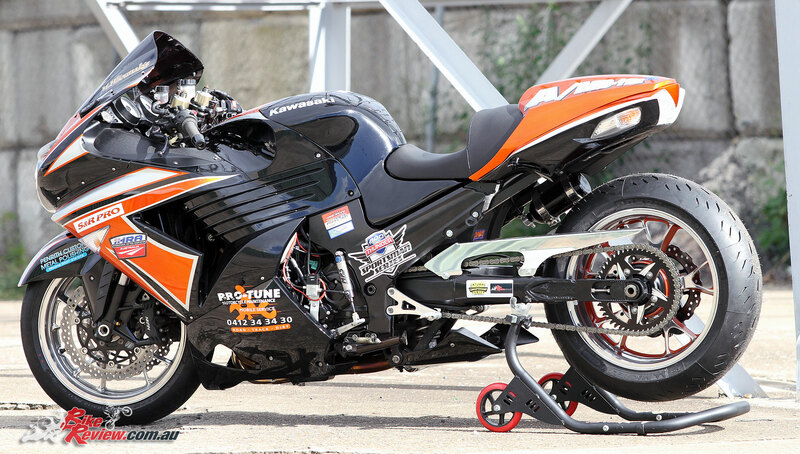 Custom Pro-Tune nine-second Kawasaki ZX-14 – Manuel with his ZX-14 and the Pro-Tune mobile servicing van. 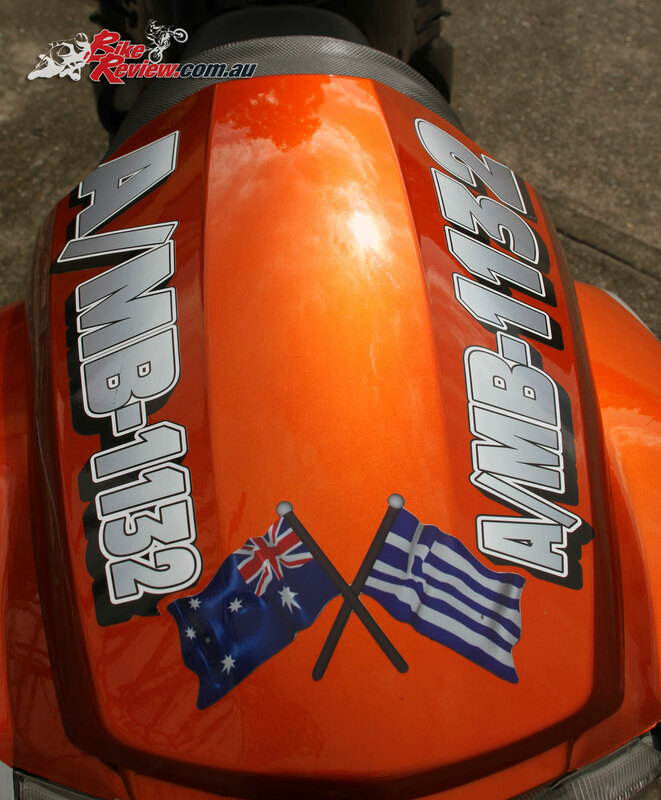 That’s a pretty telling statement from someone who’s been into motorcycles since he was six, over 40 years in total, with plenty of people getting a mention for helping along the way. 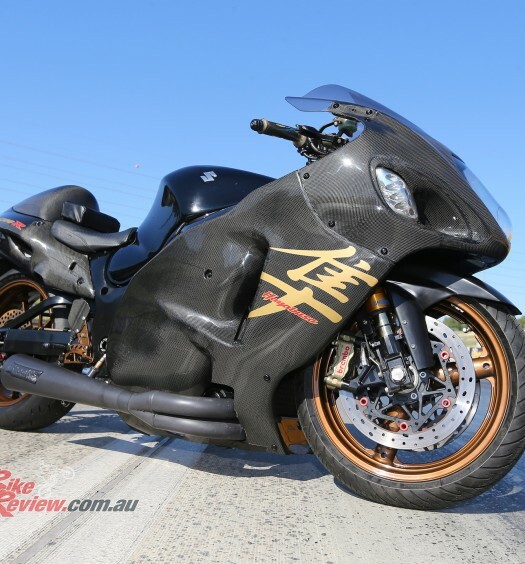 As to the future of this bike, Manuel admits he’s looking towards the high 8s. 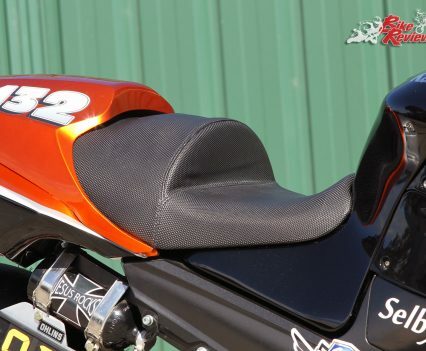 However, being mid-season now, he won’t be making any big changes, concentrating on consistency, with an eye towards repreping the bike between seasons in the future and maybe adding nitrous oxide!